Approximately 115 cultured freshwater pearls of flawless beauty. Perfectly crafted by pearl jewellery specialist Gellner. Five pieces of jewellery for the price of one: Probably your most versatile pearl necklace. 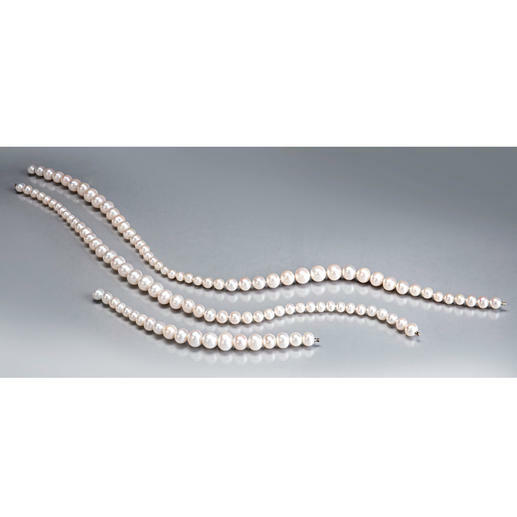 The 109cm (42.9") long pearl necklace is composed of a 43cm (16.9") and a 47cm (18.5") long collier necklace and a 19cm (7.5") long bracelet. Each element can be removed and put together again at will with vario clasps. This gives you five different pieces of jewellery for the price of one, which will fit every occasion. Perfection determines the price: Apart from the diameters of 7 to 12.5mm (0.28" to 0.49"), the flawlessness of the surface, the purity of the white, the brilliance of the lustre and the evenness of the rounded shape are the deciding quality criteria. The vario clasps made of steel are worked into the pearls with skill and thereby discreetly fit within the necklace. The 19cm (7.5") long bracelet element is threaded onto an elastic band so it has a flexible fit for your wrist.